Bike New York's Five Boro Bike Tour 2014 is over. It was my tenth one, and it was a winner. Now I am still annoyed at their head-scratching bag policy (the guy on the Trek Madone with the fanny pack the size of a Smart Car apparently didn't get the memo) but I was happy with the plastic ammo box solution I had come up with. I'm also ready to amend my Five Things I Can't Live Without on the Five Boro Bike Tour list to include a bright green Gear Tie since it was the perfect way to keep my bike secure on the Metro North train ride going into and out of Grand Central Terminal. Of course actual bike racks on the trains would be nicer. TD Bank, the presenting sponsor, came through in fine style. Their support of cycling did get me to thinking, though: CVS Pharmacy decided to stop selling cigarettes not too long ago and are being hailed as a leader in health for that decision. TD Bank could invest in health by putting a signature bike rack proudly in front of each of their branches. If they did so, they would bask in positive PR waves for years - and also be hailed as a leader. But we're getting off the subject. I'm not sure why this tour worked so well. It may have been a combination of meeting a lot of excited first timers at the start (I hope the woman I met from Queens who tried sitting on my recumbent made it to Staten Island okay) and the fact it was warmer than usual on Church Street - though another woman five feet from me hugging herself and hopping up and down on legs that featured goosebumps one could dial a phone with would probably disagree. 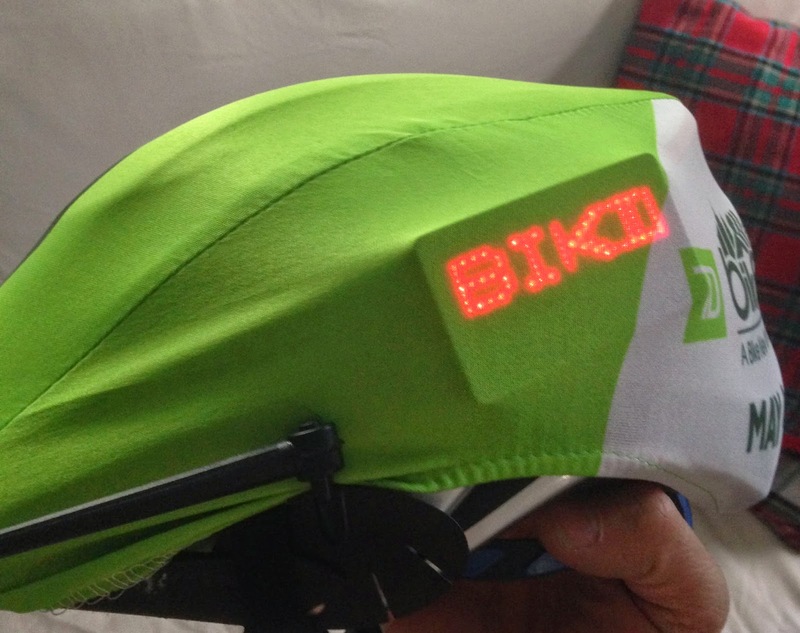 As I previously reported, they did change from the bibs this time to helmet covers, and like I said before I wondered if that created a row between Bike New York and companies like Rockin' Noggins and Nutcase helmets. Me, I didn't mind very much. 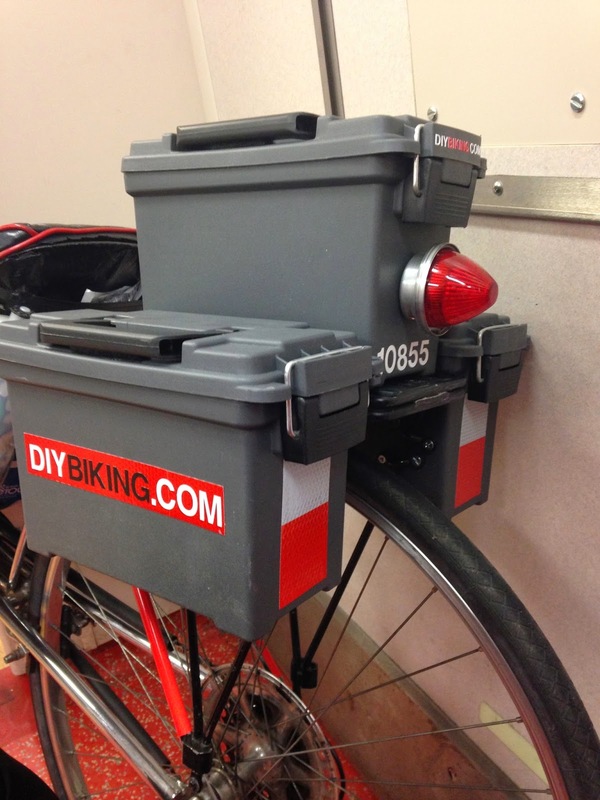 It covered my DIYBIKING.COM logo but it wasn't anything a tiny scrolling electronic name tag couldn't fix. The only real downside of the helmet cover (which I brought to a Chipotle later to take advantage of a 2-for-1 deal) is that if it is hanging on handlebars crumbs from my oatmeal raisin cookie from Zaro's tended to collect there - which I didn't realize until I put the helmet back on. Now I did take a few photographs along the route and while pedaling - a frowned upon activity by Bike New York and probably the official photographer, Marathon Foto - but a lot fewer than normal: as I'm sure most of the 32,000 cyclists would agree: this was the year of the wind: in the morning I checked the weather and saw the much feared sight of two candy-canes facing in opposite directions (the international symbol for wind). The weather reports weren't kidding, so I kept both hands on the handlebars tightly most of the time; especially after passing the rest area at Astoria Park. It was a grueling trip through Brooklyn - I thought about stopping to introduce razors and derailleurs to the indigenous hipsters living there - but the inspirational messages written in on the Verrazano Narrows Bridge did help with the grueling ascent to Staten Island. Upon arrival at the festival, I sought refueling at The Bubba's Barbikyu tent. I love the smell of perfectly grilled chicken on sticks in the morning…or any time of day, for that matter. As the Gear Tie is No. 6 on my 'need' list for FBBT; The Bubba's Barbikyu is No. 7. I'm glad the festival features them and other local options for food. 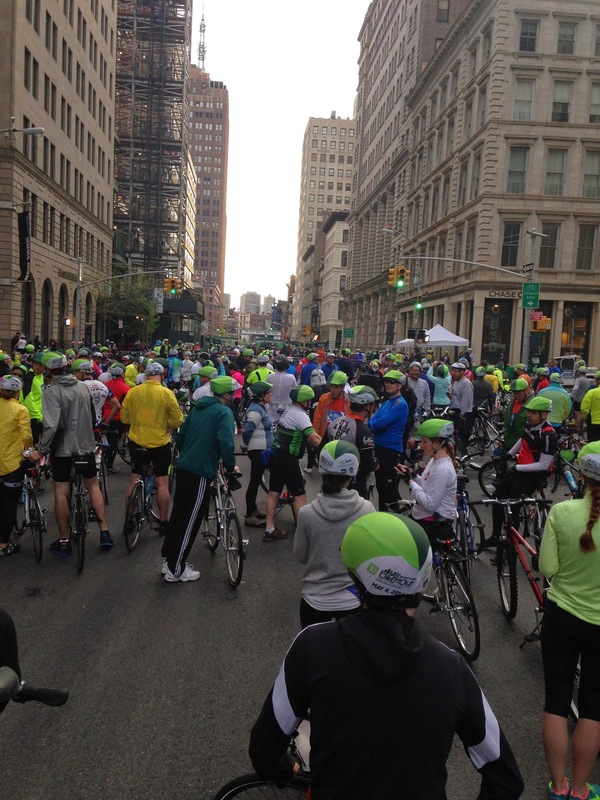 So Bike New York, TD Bank and the other sponsors deserve thanks for a great event yesterday. If I wanted to suggest anything for next year: I liked the bands playing at the entertainment zones throughout the route (I waved at each one without exceptions) but I had no way of knowing who they were. The same sidewalk chalk used on the Verrazano Bridge could be used to write the names of bands so one could photograph them with the name in the foreground so we could follow them on social media or buy a song from iTunes - if they sold any. And even though I was within sight of the stage at the start line I still couldn't hear much of the speeches in the morning (though it was great to feel thousands of noisy cyclists fall into complete silence while 'The Star Spangled Banner' was sung) so please explore other sound systems - or even a simultaneous webcast so we care hear it on our phones. Finally: Bike New York had the nice idea of giving all of us the ability to recycle our 'bike plates' from our rider identification kit…but it wasn't obvious where or how to do that. If there was a raffle every thirty minutes at the festival on Staten Island (the lovely stilt-walking woman could point the way) and all you needed to do to enter was drop off your bike plate, that would definitely encourage more on-site recycling. And of course: dump the bag policy…or at least make it easier to comply next year as you did this year. So that concludes my series on the Five Boro Bike Tour 2014. Registration for 2015 will apparently start later this year, so keep your eyes open and encourage folks who haven't done this before to give it a go. Rest your legs today and get ready for Bike to Work Week next week (and Bike to Work Day, which is on May 16). Thanks for reading and thanks for riding. 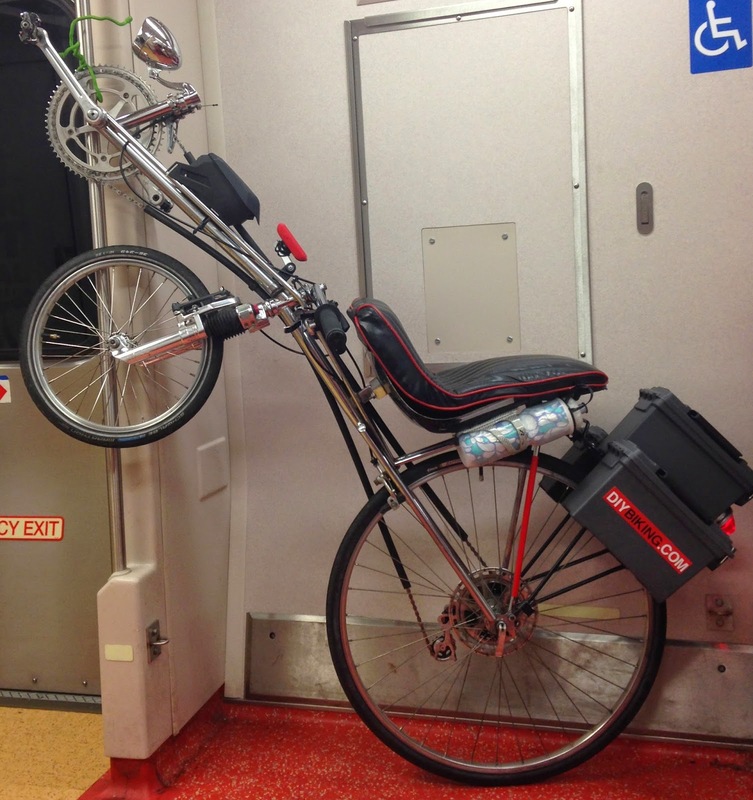 Hey--I'm sure you've posted this somewhere--but what brand of recumbent is that in the 3rd picture (hanging in the train). It looks cool.